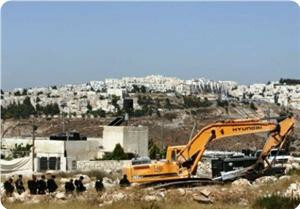 File photos shows a construction site in the East al-Quds Jewish settlement of Gilo. Israel is planning to build thousands more of settler unites in East al-Quds (Jerusalem) despite international condemnation for the expansion of Jewish settlements on the occupied Palestinian lands. Israeli lawyer Daniel Seiderman said on Friday that Tel Aviv is seeking to expand the Gilo settlement beyond East al-Quds by constructing 2,500 more settler units. Seiderman, who is active in the anti-settlement movement, told AFP that the idea was endorsed at a city planning meeting last month. "Ten days ago, the municipal planning board deliberated on a plan to build another 2,500 units in Gilo. The precise area is beyond the municipal ... line of Gilo," he said, adding that the new settler units would be in addition to plans formally announced last month for 2,000 new homes in Gilo. The news of planned enlargement comes two days after Israeli Prime Minister Benjamin Netanyahu ordered the construction of 300 new settler units at the Jewish settlement of Beit El in the occupied West Bank, which drew international condemnation. The Palestinians' envoy to the United Nations Riyad Mansour said on Friday that Israel's new surge in settlement building in the Palestinian territories is destroying hopes for any return to peace talks. "Israel's illegal actions continue to undermine any and all efforts to resume the peace process, including via direct negotiations," Mansour told the UN Security Council. Palestinians have repeatedly said that new round of talks with the Israeli regime cannot be resumed unless there is a complete halt in settlement expansion activities. Palestinians want East al-Quds as the capital of their future state. Gilo, a controversial Jewish settlement, is built on the land captured by Israel in 1967. Tel Aviv later annexed the area to the al-Quds municipality in a move not recognized by the international community. All settlements in the West Bank and East al-Quds are considered illegal under international law. On Thursday, 7th June, Jerusalem municipality decided to construct 2500 new settlement outposts in Jilo settlement that was build on the lands of al-Malha village, south of Beit Jala. An Israeli website revealed that the municipality decided on a plan to expand Jilo settlement by building 2500 units nearby the "Tunnel Road" near the city of Beit Jala. Netanyahu announced that the Israeli authority is also planning to construct 851 new settlement units in several settlements build on the lands of the West Bank. The Israeli occupation PM Benjamin Netanyahu pledged to continue "the process of construction" of Jewish only settlements in all the occupied Palestinian territory in an effort to appease the powerful settler movement. Netanyahu’s statement came in an attempt to calm the angry reaction of settlers and the right-wing extremist parties due to the Knesset's rejection of controversial legislation that would have legalized unauthorized Jewish settlements in the West Bank and saved from demolition five buildings in the Givat Ulpana outpost, which Israel's High Court ruled were built on privately owned Palestinian land. Netanyahu stressed, in a statement issued by his office, commenting on the Israeli Parliament's decision, "the West Bank is our ancestors’ land, and Jerusalem is the capital of Israel." 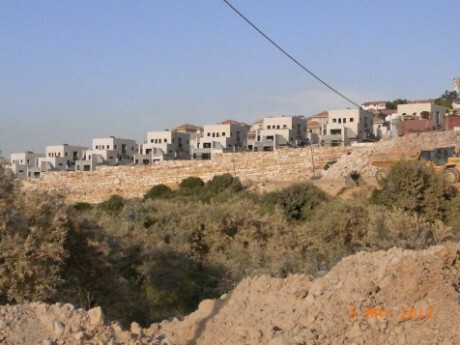 He revealed that he decided to relocate five settlement units, which were slated to be removed, from Ulpana outpost neighborhood north of Bethlehem (south of the occupied West Bank) to a former Israeli military base in the West Bank and instead he proposed an alternative plan to build as many as 300 new additional housing units in the nearby settlement of Beit El. Furthermore, Netanyahu proposed to set up a ministerial settlement committee, which has the authority to authorize West Bank construction, in order to "ensure the implementation of Israeli policy concerning promoting and strengthening the settlement," the Zionist PM said. The bill, which would have legalized unauthorized Jewish settlements in the West Bank, was opposed by the country's Prime Minister Benjamin Netanyahu and defeated, on Wednesday 6 June, by 69 to 22 votes at the Knesset, with 29 abstentions. After the results were announced, thousands of right-wing demonstrators, most of them minors, took to the streets outside the Knesset in protest, leading to two arrests. The General Delegation of the PLO in Washington said Thursday it was dismayed by the Israeli government’s latest "egregious violation" of signed agreements. "Settlements are illegal under international law, their expansion contradicts agreements signed by Israel and the PLO, and their continuation gravely prejudices the final status issues," the PLO office said in a statement. Israel has dismissed criticism of the plan to erect 851 more settler homes, projects that appeared aimed at placating settlers angry with Prime Minister Benjamin Netanyahu. "They need to condemn. We need to build," Construction and Housing Minister Ariel Attias told Army Radio. Facing down settlers and their supporters, Netanyahu defeated an attempt by ultranationalist lawmakers to "legalize" all settler homes on private Palestinian land in the West Bank. The bill was proposed after the Supreme Court ordered the removal by July 1 of five apartment buildings erected on Palestinian tracts in the settlement of Beit El. "The message is clear: this Israeli government’s priority is to appease the settlers, not to resolve the conflict," the PLO mission said in an emailed statement. It condemned "in the strongest of terms" the latest decision by the Israeli government, and urged the Obama administration and international community to insist on a settlement freeze. "It should have been clear by now that this stupefying inaction by the international community is precisely what emboldens Israel," the diplomatic mission said. PLO officials are "greatly disappointed by the astonishing inaction by the global community that amounts to an international cover-up for Israel, especially by the US administration," it said. The reply came after a State Dept. spokesman told reporters Wednesday that "We do not accept the legitimacy of continued Israeli settlement activity," a standard US response. The spokesman, Mark Toner, said the Americans "continuously raise" the issue of settlements with Israel. Asked how effective that had been in the past few years, as Israel refused to implement a full settlement freeze, the spokesman responded that "I'm not able to give it a grade." The PLO mission said America's position had accomplished little, as the Israeli government "will not be deterred" by more statements decrying settlement construction as unhelpful to peace efforts. "Furthermore, if the US continues to treat its support to Israel as unconditional, Israel will never have the incentive to halt its destructive and reckless settlement construction," the PLO office warned. Israel is pushing the region into "dangerously unpredictable consequences," it said. The Turkish foreign ministry issued a statement on Friday lashing out at the Israeli decision to build 851 new housing units in the occupied West Bank. 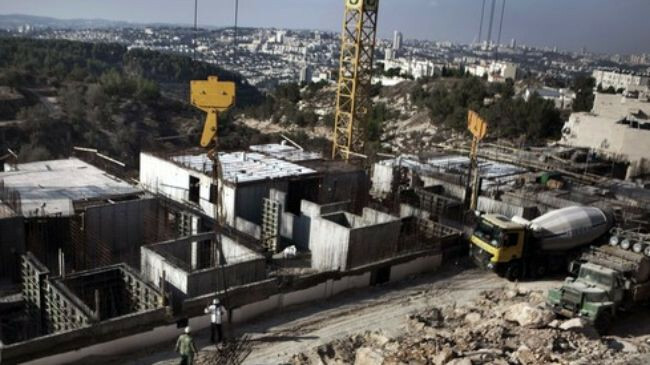 The ministry said that the construction of more settlements in the occupied Palestinian land was in violation of the international law. The Israeli attempt to legalize the building of those settlements did not change the reality of the situation, the ministry added. It said that ignoring the international reaction to such practice constituted an obstacle to achieving peace and a solution to the Palestine question. The ministry advised the Israeli government to abide by the international law and to reverse such a policy, which threatens options for a lasting peaceful settlement in the region. File photo shows the illegal Ulpana outpost adjacent to the Beit El Jewish settlement near the Palestinian West Bank city of Ramallah. The United Nations Middle East envoy Robert Serry says Israeli Prime Minister Benjamin Netanyahu’s plan to expand Beit El Jewish settlement in the occupied West Bank is "deeply troubling." “The latest announcements for adding 300 [residential] units in Beit El, [which is] deep inside the West Bank, are deeply troubling," The UN's Special Coordinator for the Middle East Peace Process said on Thursday. Serry reiterated that it is "the international community's view that all settlement construction whether on private Palestinian land or elsewhere in occupied Palestinian territory is contrary to international law." Netanyahu ordered the construction of 300 new residential units on Wednesday after the Israeli parliament rejected a bill to legalize settlement outposts. All settlements in the West Bank and East Jerusalem are considered illegal under international law. The outposts are also illegal under Israeli law. Last year, an Israeli Supreme Court ruled that five buildings which are home to 30 families at Ulpana were built entirely on private Palestinian land and must be demolished. Netanyahu ordered the transfer of the buildings at Ulpana to a nearby former army base in another part of Beit El and the construction next to them of 300 new housing units to placate settlers. "Beit El will be expanded, the 30 families will remain in Beit El, and 300 new families will join them," he said. Israel continues its settlement construction in the occupied Palestinian territories despite condemnation from the international community. France has condemned Israeli Prime Minister Benjamin Netanyahu’s plans to expand Beit El Jewish settlement in the occupied West Bank by adding 300 new houses. “We call on Prime Minister Benjamin Netanyahu to abstain from implementing these plans. We recall that colonization in all its forms is illegal under international law, undermines the two-state solution at ground level, and is an obstacle to peace,” France Foreign Ministry spokesman, Bernard Valero, said on Thursday. All settlements in the West Bank and East Jerusalem are considered illegal under international law. The outposts are also illegal under Israeli law and the regime has agreed to remove all or part of six illegal outposts following a Supreme Court ruling. Last year, the court ruled that five buildings which are home to 30 families at Ulpana were built entirely on private Palestinian land. Thousands of Israelis have been living in a dozen settlement neighborhoods since Israel's occupation of the West Bank and East al-Quds (Jerusalem) in 1967. The Ministry of Foreign Affairs Thursday condemned in a statement Israeli Prime Minister Benjamin Netanyahu's approval to build 851 new housing units in illegal West Bank settlements. “Prime Minister Benjamin Netanyahu's approval is a defiance of the will of the international community and a breach of the international resolutions,” said the statement. It called on the Quartet to promptly intervene to stop the Israeli systematic destruction of the principle of a two-state solution. It also called on the United Nations Secretary-General Ban Ki-moon and member states of the Human Rights Council to implement the decision of the UN Security Council regarding sending a fact-finding mission to investigate settlements in the Palestinian territory, to take the necessary actions to deter Israel, stop its violation of international law, and to stop its actions as a state above the law. The United Nations Special Coordinator for the Middle East Peace Process, Robert Serry, in a statement Thursday reiterated the International Community’s view that all settlement construction is contrary to international law. He said that the latest announcements, including adding 300 units in Beit El settlement near Ramallah, deep inside the West Bank are deeply troubling. Serry reiterated his recent warning to the Security Council that 'if the parties do not grasp the current opportunity, they should realize the implication is not merely slowing progress toward a two-state solution. Instead, we could be moving down the path toward a one-state reality, which would also move us further away from regional peace in the spirit of the Arab Peace Initiative”. The Israeli government of Benjamin Netanyahu has sanctioned the construction of 850 new housing units in four settlements in the West Bank. Hebrew sources said that Netanyahu gave the green light for the building of those units in a cabinet session on Wednesday. 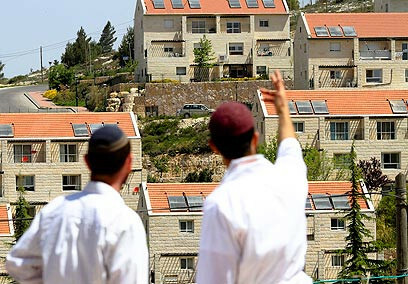 They added that the housing units would be built in Gush Etzion in Al-Khalil, Efrat in Bethlehem, Karni Shimorn, north of the West Bank, and Beit El in Ramallah, which got the biggest number with 300 units. Netanyahu pledged to expand the settlements in the West Bank especially Beit El within his plan to link those settlements to the Jordan Valley settlements. The Peace Now movement revealed an Israeli plan to build a tourist center in Ein Silwan district south of the Aqsa Mosque. Spokeswoman for Peace Now Hagit Ofran stated on Thursday that the settlers of Gilad society intend to exploit the tourist sector to justify and carry out their future settlement plans. Ofran said the district committee for planning and building would discuss this plan next Monday. 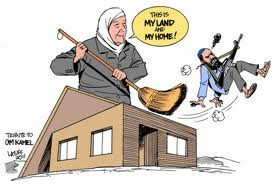 She expressed its dismay at the Israeli government for supporting settlement projects in east Jerusalem. For his part, director of Wadi Hilwa information center Jawad Siyam stated that there are settlement activities of a tourist type in Jerusalem to impose a history that does not exist, noting that the tourist center of Gilad society is part of a wider settlement project called the holy basin. He affirmed that the Israeli government and its settlers target all the Palestinian lands and real estate in east Jerusalem and they use all means to gradually seize them and expel the Palestinian natives from the holy city. Recent news has made it clear that a major building boom in the Israeli settlement program is underway in the area of the already huge Ariel settlement which points a “finger” extending 20 km across the mid-northern West Bank from the “Green Line” towards the Jordan Valley. Several settlement expansion or new settlement building projects in areas surrounding Ariel, have recently become public knowledge. These projects are at various stages ranging from notices from the Israel Civil Administration (ICA) of the confiscation of Palestinian lands to the building of finished housing units. It is clear from this that plans to expand settlement building in the Ariel area have been in gestation for some years at least and are continuing, and that the building projects themselves have been under way for at least a year. New plans announced in the last two weeks have identified an expansion to the north of the Qedumin “finger”, north of the Ariel settlement itself. These expansions and new settlements may partially explain the Israeli Government’s firm refusal to stop settlement expansion in the face of repeated demands by both the Palestinian Authority and the international community including the USA. The rate of growth of settlements may be seen from the fact that only two years ago there were 21 settlements in Salfeet District compared to 19 Palestinian villages and five years ago there were 18. When these new developments are complete there will be 24. These new settlements will be built on land in Areas B and C which has been confiscated from rural villages where agriculture, and particularly olive trees, are the main livelihood. For example, the effect of the further proposed confiscations of their lands on the village of Kefr Deik will mean that essentially all usable village land—80% of the total—will have been taken for settlements and their associated facilities over the last 30 years. The effect on these Palestinian villagers and their agriculture-based economy will be disastrous. One consequence for the villagers will be more purchase of Israeli fruit and vegetables because they will no longer have the land to grow their own. The settlement projects include the following. • Etz Efraim: large grey houses are already being built as an expansion of the Etz Efraim settlement on the lands of Mas-ha. 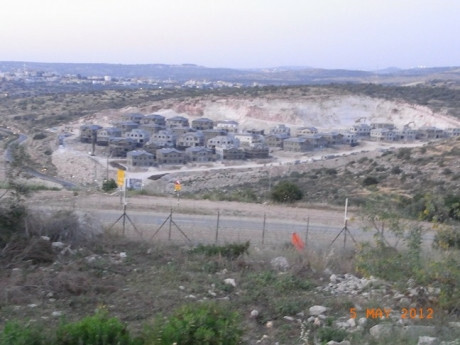 • Leshem settlement of two-storey houses, an expansion of Alei Zahav, has been under construction for at least the last 12 months on lands owned by Kefr Deik to the west of the village. • Pedu’el settlement: the Municipality of Kefr Deik in Salfeet District has recently received notice from the ICA that their lands south west of the village will be confiscated to expand Pedu’el settlement. This means that some 80% of the total Kefr Deik lands will have been taken in the last 30 years. • Biddya village: as reported in Israeli daily, Haaretz (Friday 18 May, pages B3 and B7) the village of Biddya has received notice of confiscation of its lands. In this case notices were placed in plastic bags under stones and between the trees, and the land to be confiscated was not accurately described. 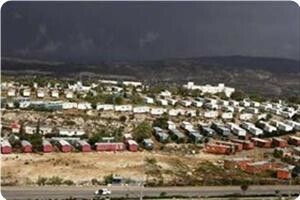 News Network reported on Friday 18 May Israeli plan no 11134/M-A to expand the Ariel settlement by 2100 housing units in two phases on extensive village lands confiscated in Qalqilya and Tulkarem Districts. In fact although the news item talked about expanding the Ariel settlement, judging by the names of the villages slated to lose land the expansion will be north west of the Qedumin “finger” and of the Qedumin, Immanuel, Qarna Shomron and Ma’ale Shamron settlements. 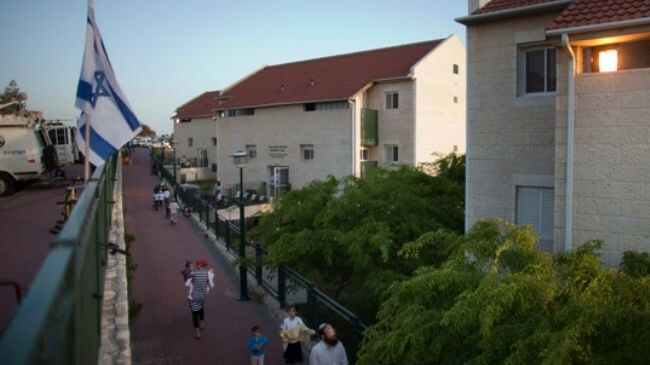 1 700 new housing units on large areas of the village of Kafr Laqif located east of Qalqilya between the towns of Azzoun and Jinsafut in Qalqilya District. 2 1400 new housing units on large areas of Baket Al Hatab, Izbeat Abu Hamada and Kafr Aboush in Tulkarem District. Al Keffriyet Municipality comprises a group of seven villages with a total population of 10,000 people including these three. When interviewed, the Mayor, Farouq Ghanayem, stated that he had received no official documentation from the Israel Civil Administration and was relying simply on the media reports for information. However the Israeli military with helicopters have been seen there frequently. The area that appears to have been identified by the Israelis for construction of housing is hilly and covered with olive trees, and is currently remote with only dirt tracks for access. There was a small village, Al Hamadi, there at one time, but because of limited access and lack of water, the village was abandoned years ago although the remains of the houses are still standing. It is very obvious, however, that this land is close to Jayyous and the “Green Line” so that construction of an access road to Israel would be easily possible. • Jayyous is north of Qalqilya and about 5 km from the “Green Line”. The Separation Barrier in this area was built to the west of the village and across its lands, placing about 75% of Jayyousi lands and the six water wells on the Israeli side of the Barrier in the “Seam Zone”. There was always a plan to expand the Zufim settlement northwards onto this land, part of which has already been declared “Approved state land”. Local sources suggest that this plan is likely to be implemented before long. Following legal action by the Jayyous Municipality, the Courts have ordered the Israeli military to change the line of the Separation Barrier to return some land and one water well to the village. However this change to the line of the Separation Barrier will leave the land identified for the Zufim expansion on the Israeli side although the timing of its implementation is uncertain. land of Al Keffriyet--site for new settlement? The procedure for confiscating village land is brutal. In the case of Biddya, for example, Haaretz reported that Eviction Notices were left under stones and among the trees. They were issued by officials in the Israel Defense Forces, The Civil Administration of Judea and Samaria, the Custodian of Government Property, and the Central Monitoring Unit. The documents do not specify which land—nobody had bothered to fill the blanks on the forms out clearly. Almost 30 years ago Israel tried to expropriate this land, but eventually gave up on its plans after a protracted legal battle in which the residents presented deeds to the lands in court. By then one of the farmers, Ibrahim Der-Ahmed, who had tried to stop the bulldozers, was dead, shot by Israeli soldiers. His son is now part of the campaign to retain the village lands. On Thursday 25 May the Israeli authorities issued a decision to seize 30 dunums of land belonging to Palestinians from Deir Istiya, near Salfeet. Rizik Abu Nasser, head of the popular campaign against settlements in Salfit, quoted the order as saying the land was being seized "for security reasons and to prevent terrorist operations." The mayor, Nathmi Salman, condemned the decision. He said it was the third such order in a row to seize land from Deir Istiya. 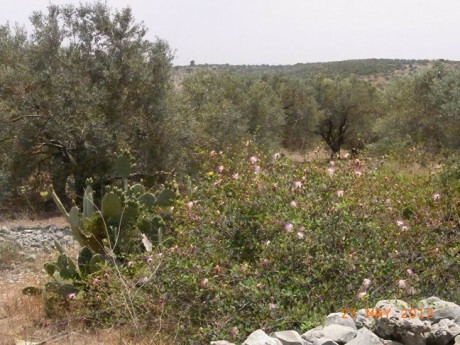 Many farmers living in Deir Istiya own land in Wadi Qana, a traditional beauty spot and picnic area for Palestinians as well as being economically important for its olive and other fruit trees for generations. There are now seven Israeli settlements including Yofim, Yaqir and Immanuel on the hilltops surrounding Wadi Qana. Settlers and the Israeli military frequently cut olive trees. There are rumours that this land will be declared a closed military zone, and the villagers worry that their access to their lands in Wadi Qana will be completely prevented. The applied research institute Arij said Israel finished the construction of a bypass road extending from around Har Homa settlement in Abu Ghoneim Mount southeast of Jerusalem to Bethlehem city as part of its settlement project which it describes as the greater Jerusalem project. In a report issued on Wednesday, Arij stated that the new bypass road is aimed at creating territorial contiguity inside the settlement itself and preparing the open areas that surround it for the establishment of two other big settlements extending to Bethlehem known as Har Homa C and Har Homa D.
It underlined that the information it obtained affirms that these two settlements would be built on an area of 1,080 dunums of Bethlehem land, and one of them, Har Homa C, will be to the southeast of the main settlement of Har Homa, while the other will be to its northwest. Arij explained that the future settlement projects in the vicinity of Har Homa settlement are part of the Israeli successive governments' united plan, known as the greater Jerusalem project, to annex the open areas around Jerusalem and Bethlehem and bring them to its territorial control. It added that this Israeli project is intended to create a new geographical and demographical fait accompli that is hard to change in the future. Israeli Prime Minister, Benjamin Netanyahu, stated Tuesday that he would fire any minister who votes for the so-called “regulation bill”, meant to legalize illegal settlement outposts in the West Bank, during a Knesset vote that will be held on Wednesday. Israeli Ynet News reported that Netanyahu stated that any minister of deputy minister who back the bill will be fired as the proposed bill, if passed, would lead to the legalization of Ulpana illegal outposts in the Beit El settlement, near the central West Bank city of Ramallah, and the rest of the illegal Jewish settlement outposts installed by extremist settlers on privately owned Palestinian lands. The Ynet News added that after Netanyahu made his announcement, ministers of the Shas religious movement said that they not attend the voting session, adding that ministers of the Yisrael Beitenu (Israel Our Home) fundamentalist party of Foreign Minister, Avigdor Lieberman, will likely skip the vote. 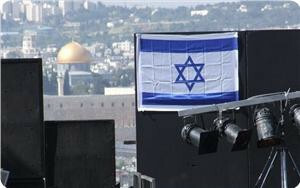 The website also said that Shas movement’s members of Knesset said that they will vote for the bill. The “Regulation Bill” was proposed by member of Knesset, Zevulun Orlev, from the Jewish Home (Habayit Hayehudi) party, with the sole purpose of avoiding the implementation of a ruling made by Israel’s High Court that ruled in favor in evicting five homes illegally built in Ulpana outpost. But the Israeli Prime Minister provided another plan that calls for relocating the homes to a military zone in Beit El settlement. Netanyahu said that his government has to deal with what he called with “infiltrators” (referring to alleged Palestinian attempts to attack the settlements) and several major domestic challenges, adding that “such issues can only be dealt with by a unified government”, the Ynet said. On the ground, several hundred settlers held a protest, on Tuesday evening, in front of the High Court in Jerusalem; the protest was held in front of a protest tent installed by a number of settlers who are holding a hunger strike. The protesters were joined by Member of Knesset, Danny Danon, of Netanyahu’s Likud Party, and the Rabbi of Keryat Arba’ illegal settlement in Hebron, Dov Lior, in addition to heads of local councils of several illegal Israeli settlements in the West Bank. The Ynet quoted Lior stating that “the land of Israel belongs to the Jewish people”, and called on the ministers to vote for what he called “true democracy” during the cabinet vote on Wednesday. Addressing Likud MK’s, Danon said that they should remember “what they promised the voters during elections”, adding that the removal of the Ulpana outpost “is a surrender that will be followed by thousands of concessions in the West Bank”, the Ynet said. The Ynet further reported that some settlers living in the Ulpana outposts have started preparations for resist the evacuation, adding that, several days ago, the settlers brought a truck loaded with tires, likely to be placed and burnt in the streets to obstruct the army. Furthermore, The Ynet said that local Rabbis in the settlement are likely the ones who determine the level of resistance to the evacuation, and added that this does not mean that extremists will not resort to violence. Israel’s settlements in occupied Palestine, even those built on what Israel dubs as “state lands”, are illegal under International Law and the Fourth Geneva Convention to which Israel is a signatory. The Palestinian Authority in the West Bank had to peace talks with the government of Netanyahu due to the ongoing Israeli violations against the Palestinians in the West Bank, occupied East Jerusalem and the Gaza Strip. These violations include the demolition of homes and the destruction of private property, ongoing settlement construction and expansion, the escalating violence carried out by extremist settlers, and the ongoing Israeli military invasions into Palestinians communities in the occupied territories. Palestinian land, to the Beit El settlement near Ramallah in the central West Bank. Netanyahu suggested the plan in order to defuse the growing controversy within his cabinet over the demolition of the illegal outpost. This plan aims to move Israeli settlers from the outpost to an illegal settlement constructed on confiscated Palestinian land. Netanyahu’s plan included three stages: The first stage involves relocating the illegal outpost and moving it several hundred yards away to the settlement of Beit El. The second stage includes reinforcing the settlement movement by building 10 housing units in the illegal settlement for every house moved the final stage entails deterring future petitions by having Israel battle any legal motion presented on the outpost issue. The PLO as well as the Palestinian Authority have condemned this plan. Acting PA Chief, Mahmoud Abbas, who has been pressured by the Obama administration as well as Israel to resume negotiations with Israel, has repeatedly claimed that the Palestinian Authority will only resume negotiations when Israel halts all settlement activities. This, as PLO chief negotiator has met his Israeli counterpart many times in the past few months. About 30 Jewish families live in the five three-story apartment buildings in the Ulpana neighborhood of the Beit El settlement in the occupied West Bank. Netanyahu stated that the construction of ten settlement units for each evacuated building will lead to residence of one thousand more new settlers in Beit El.